This question has a few parts: 1. Is it possible for a river to naturally form in the shape of a spiral? 2. If not, would an artificially-formed river, in the shape of a spiral, realistically maintain this shape? 3. If this is possible, what sort of a landscape would be necessary? In the world that I'm building, a small group of people make use of magic to travel to a parallel universe and build a new society. The new planet that they land on has one circular land mass surrounded by water. I was imagining medieval or renaissance level technology for the world that they come from, but I'm open to changing this. Unfortunately, I don't know very much about rivers, except that they flow downward, generally toward an ocean, so elevation is a huge factor. I guess my biggest concern is how this world's landscape would have to be shaped in order for a spiral river to exist. I'm especially interested in this because, for the purpose of the story, I want the world to appear as utopian as possible (i.e. minimal rough terrain, no crazy/jagged mountains, etc.). Even though magic exists in this world, I don't intend on it being widely used by the inhabitants, as it's almost impossible to wield. But, I'm wondering if the only way for my beloved spiral river to be formed and maintained is through the use of magic, and some fantastical hand waving. I haven't developed my magic system very much yet (as you can probably tell), and I'd like to get a sense of how much of my world can be formed 'naturally' before I decide what its magic needs to be capable of. No, there is no way to get a natural downhill topological river spiral. Extensive use of concrete and stone and a lot of upkeep. First, rivers change shape continuously. A river's shape is rarely stable for long, since the outer part of a curve undergoes some very strong cutting forces, while the inner parts often undergo deposition. Even if you get a shape with spiral shaped depression (it can't simply be a bowl), it will not exist for long as the the water cuts it apart. Second, rivers occasionally flood, and in doing so a spiral river will cut across its bank and stop being a spiral instead following the downward slope. As the water drains, this new shape will cut itself into the river, as it will experience far stronger cutting force than the spiral. People seriously underestimate the sheer cutting power of flowing water. The stronger the slope the better at cutting it is, and cross cutting a spiral will have a lot of power, thus it will not exist for long even if you somehow got it to form. this is why rivers can cut through uplifting mountains. You can make a man made one as easily as you can make any man made river, it just takes, time, money, and maintenance. Maintenance is key such a shape will need significant maintenance over the long run. I guess it all depends on how circular you want your spiral to be and how many turns you want your spiral to have. For a natural river, which is admittendly not very circular, with 3/4 turns I offer the Brahmaputra river. 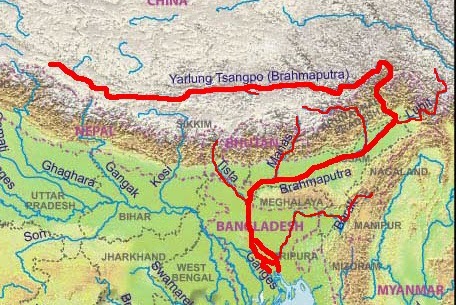 It starts north of the Himalayas, far west of the river mouth, flows eastward far east of the mouth, then south through the eastern end of the Himalayas where it takes a turn to the west in the valley between the Himalayas and the Meghalaya mountain range before turning south again to get lost in the Bangladesh delta system. It would have flowed more to north, making it more circular, if the Tibetan plateau above Sikkim and Bhutan would have provided more of a bulge and the mouth would have been further to the west, making the circle fuller, if the Meghalaya range would have progressed further to the west. More than one turn seems hard to do naturally, given plate tectonics and weathering of older ranges. For instance, for the Brahmaputra this would have meant going west until the western end of the Himalayas, then turning north again (there would have to be a major fault/rift valley in the Himalayas at this point) where it would loop round the northern end of the Tibetan Plateau, turning south east of the Himalayas again, perhaps through the course of the upper Mekong, providing 1 1/2 turns. But this is worldbuilding so it possible to posit a central mountain range with a succession of older, lower mountain ranges north and south of it and series of shear rifts and gorges east and west of the central mountain range, much like the Three Parallel Rivers area east of the Himalays. The river would then originate in the central mountain range, flow through each trough between the the younger and older + 1 mountain range to the north and south, cutting through west and east to the north and south through the shear gorges. Unlikely, yes, but impossible, no. 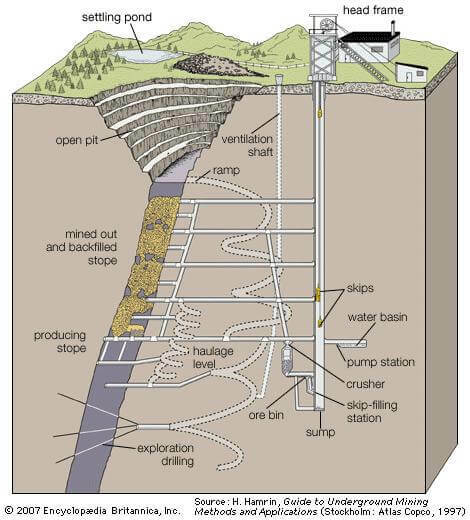 An artificially formed river leading into an open pit mine could follow the spiraling road (perhaps concrete reinforced & water resistant) down to the bottom of the pit, where it enters an underground cave to become an underground river. If the pit had a water-vulnerable rock only at the bottom, like limestone or chalk, the pit itself might survive for longer. And if it were on the side of a mountain or valley the water could have a short trip to emerge from the cave. A giant fossilised spiral whelk. Since this is an alien world, such a thing could exist, with the river forming due to rainfall collecting in the central lobe and following the shape of the shell out. This would have to be a very small river, more of a trickle, as a strong current would quickly dissolve the limestone. A freak accident when a lake of lava, just out of a volcano, ran into a cyclone. The eye of the cyclone settled in the middle of the lava lake and forced the surface into a spiral shape, while the cold wind and rain solidified the lava before it could settle. Again, very unlikely, requiring a very strong cyclone that held its position long enough, near a volcano, whose heat would try to push it away. Rivers usually flow straight down gradient but there is a phenomena called something like "structurally bounded flow" (I'll put a link in when I can remember the exact name), in which the underlying bedrock has an unusual impact on the way rivers form and flow. Usually this is in the form of rivers that are unusually straight or have sharp 90° bends because they're following fault scars in the ground but I can think of a possibility for a spiral from. Consider the ring-dike this gives an essentially circular structure that water will erode slower than the surrounding rock. 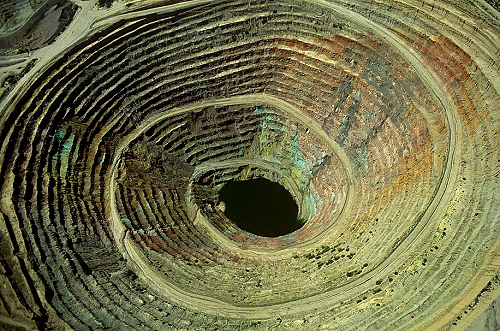 Now consider a series of nested ring-dikes, which does occur in nature; if there is a spring in the centre of the nest, like the waters of Emi Koussi the water will flow outwards pooling within the circles until it finds a weak spot to break through the successive walls. If the weakness were supplied by a fault formed after the nest it's possible, though not naturally very likely, that the water would spiral out rather than cutting straight along said fault. Perhaps. Not for long in geological timescale, but long enough in human terms. 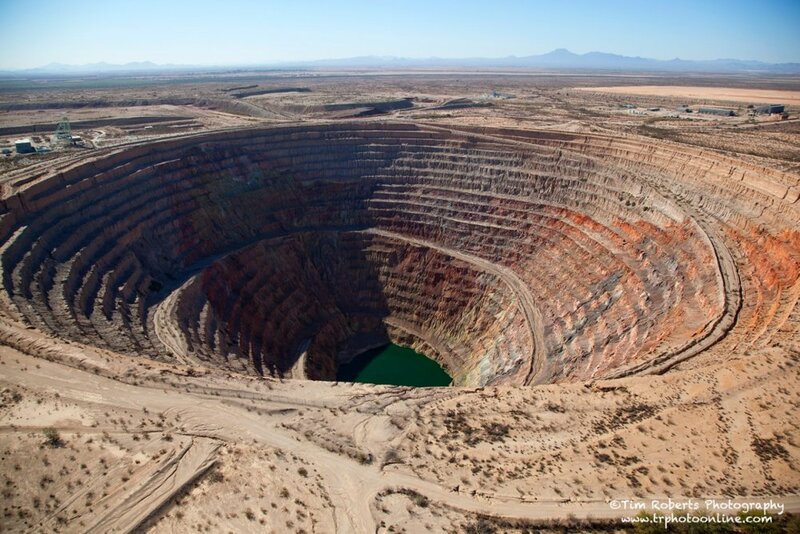 You would need to start with a spiral valley that starts high in the centre of a landmass and descends outwards. You couldn't have the river cut its own valley because it would never follow a spiral path, so you'd need a geological event that did this for you. Something that pushed up a central massif and simultaneously twisted it around. I doubt that normal plate tectonics would do something like that, but you could imagine a shield volcano caught between two geological plates that move past each other and create a shear force that in turn twists the volcano into a swirl over geological time. I doubt any self-respecting geologist would give me the time of day after this image, but hey, we're the world-builders. It may be feasible on a large scale and only with human or magic intervention. Let's imagine the circular land mass has a more or less regular dome shape (like a volcanic island, just bigger). Whenever it rains, the water flows directly from the center of the island to the nearest shore and into the sea. Now someone gets the great idea to hold some of the water back in short-term reservoirs. They start digging channels in parallel to the shore line to keep the water from flowing directly into the sea. The logical thing to do is to increase the size of those reservoirs. If that's not possible, you dig the next reservoir some kilometers closer to the shore to hold back the water that escaped your first reservoir. Now let's say that for some reason the people don't want bigger reservoirs, but redirect the water into other parts of the land instead. They continnue digging their channels longer and longer, always trying to stay in parallel with the shore line. Here is real river spiral from the headwaters of the Murrumbidgee in Australia! Water coming off a ridgeline saddle at -35.671290°, 148.616018° runs east at 90° for 100 metres, where it then forms a proper recognizable watercourse running at 45° North East. Over 2.25 km this watercourse curves to the left for 135°, exiting into McPhersons Creek running west. McPhersons Creek then runs WSW for 4.3 km to exit into the Murrumbidgee River. The Murrumbidgee runs south for 13.5 km, then tracks South West [bar a couple of northerly indents] for 70 km to a point 9 km north of Cooma. Here it sharply turns to the north, traveling this direction for 82 km to the southern suburbs of Canberra. 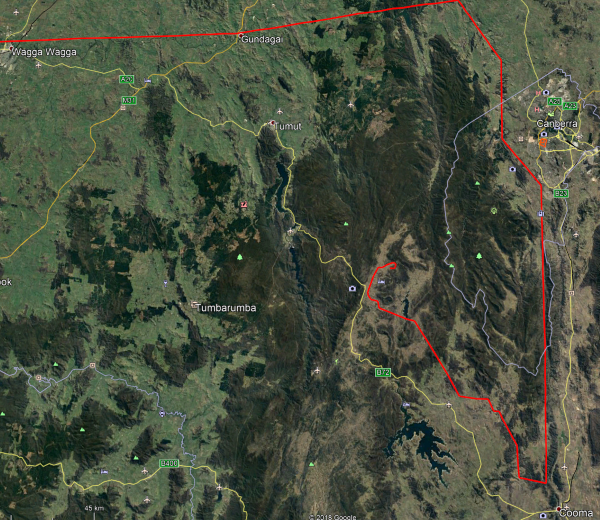 Here it turns to the north west, then travels northerly again for 70 km to enter Burrinjuck dam. From this point it effectively tracks 840 km west to Morgan in South Australia, where it turns south and exits into the Southern Ocean after traveling a further 190 km. Within this 190 km southerly track there are many turns and loops that head back to the east or north east. The most northerly flowing of these bends is Big Bend, 70 km south of Morgan where the river flows 30° east of north for 3.5 km, however as this is well north of the starting latitude it could be argued it is not spiralish. A much less controversial end would be the 14 km Monteith to Talem Bend section that flows 125° south East. This ending at Talem Bend gives a spiral of 685°, whereas if the Big Bend turn is accepted there is 780° spiral. So spiral rivers are definitely possible!!! This image is of the spiral. It excludes the final 800 km. The starting 100 metre easterly flow exaggerated to be 1,000 metres. How far from the source to the sea? There are certain constraints to the length of the river and the way it will flow. It goes on to say that the river Jordan has a ratio of 2:1 which is unusually high, so you're looking at an upper limit of twice the air distance from source to sea as the crow flies. The ratio of a spiral is of course considerably higher than that. There may be a brief period where your river does a full loop of a hill without artificial assistance, but it's unlikely to last more than a couple of flood seasons before straightening itself out. Two potential solutions; a river that wraps around a mountain, and a spiral in which the centermost point ends in a waterfall. Not the answer you're looking for? Browse other questions tagged science-based geography rivers or ask your own question.